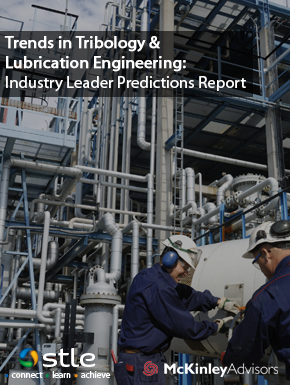 A new 20-page report examines the forces likely to influence markets and business practices in the tribology and lubricants sector during the next three years. Readers will gain insights into global trends in the six areas of business and economics, government, supply chains, finance, workforces and culture. This is a joint project by STLE and Association Laboratory Inc. (ALI), a Chicago based consultancy. It combines information from a recent STLE membership needs study (also conducted by ALI) with a comprehensive research project involving business leaders from 54 different industries and professions. Order PDF version of full report by adding to your online cart. Delivered via email. Please be certain your email address is correct in your record prior to ordering for instant delivery.